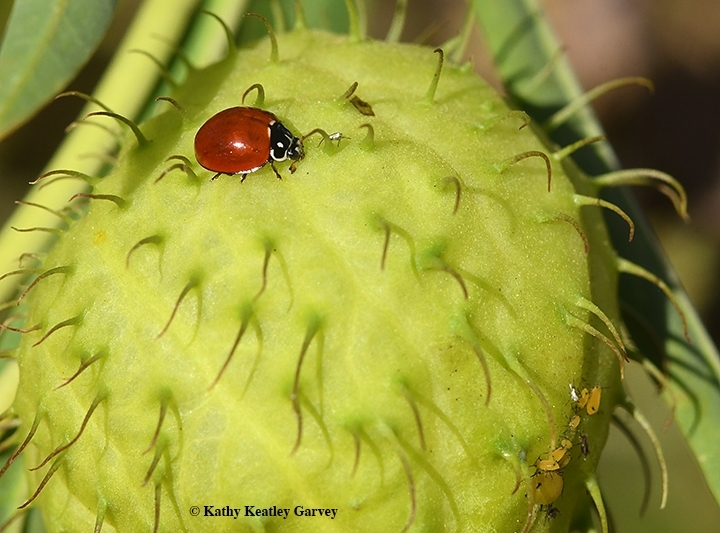 See those red spots on your milkweed seed pods? Lady beetles (aka ladybugs or "garden heroes") are feasting on aphids. And they're having a ball. We've been watching the critters on our milkweed, Gomphocarpus physocarpus, for the last couple of months. The plant is a favorite among monarch butterflies, florists and interior decorators. This is the host plant of the monarchs; caterpillars eat only milkweed. It's also a "hostess" plant; florists add them to their floral bouquets and interior decorators grace their holiday tables with them. In fact, interior decorator Allison Domonoske of South Carolina transformed the White House Thanksgiving tablescape with moss, driftwood, pine cones, little white pumpkins and what she called "balloon-plant milkweed: large, green, ball-like flowers." We call them "lime green ball-like pods, covered with tiny spiny hairs"--or you could call them "spiky seed pods," as the Washington Post did. At any rate, they're often used for decorating. Hmm, a forest green Douglas Fir Christmas tree adorned with lime green spiky seed pods? With red bows amid the green boughs? Gomphocarpus physocarpus to the rescue! According to the Master Gardener Program, "the name physocarpa comes from the Greek physa meaning bladder and karpos, fruit, referring to the inflated, bladder-like fruits. 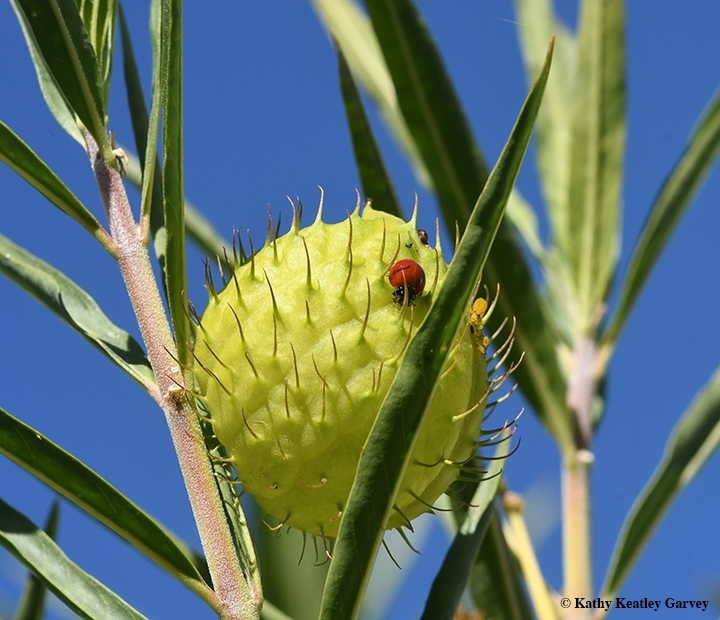 It has a plethora of common names including balloon plant, balloon cotton-bush, balloon milkweed, bishop's balls, elephant balls, hairy balls, monkey balls, swan plant, and many others." It's also known as goose plant, giant swan milkweed, family jewels, Oscar, and by its former botanical name, Asclepias physocarpa. It's a tall, spectacular plant that can reach a height of an NBA All-Star. Last summer monarch butterflies laid their eggs on it, lady beetles kept the aphids off it, and praying mantids kept everything off, including bees, butterflies and beetles. 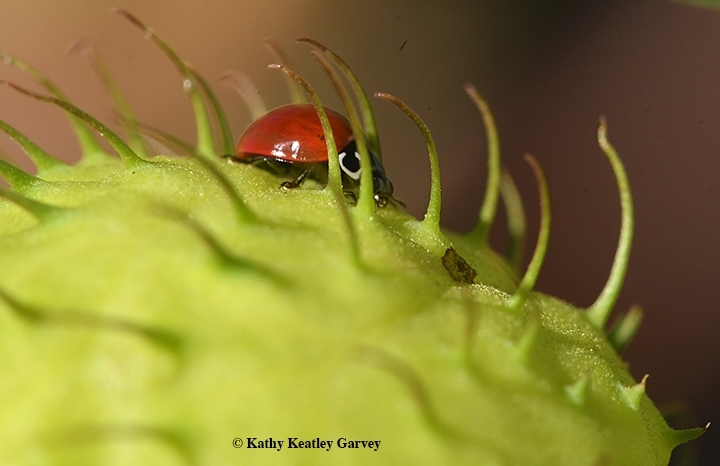 If you have some growing in your garden, think holiday decorations...minus the red lady beetles, the First Ladies of the Garden, and their prey.